1.1. How much soil do trees need? 1.2. What are the industry accepted methods for doing this? The very simplest method is the Crown Projection formula, which takes the mature canopy area of the trees, multiplied by a depth of 0.6m (2 feet). There is another simple formula, called the Balance Formula, which removes inconsistencies due to tree crown habit. 1.3. Are there tools for doing this? Yes, Citygreen has a convenient online tool for calculating target soil volumes by both of the above methods. 1.4. How accurate are these methods? 1.5. What shape does the treepit need to be? While a symmetrical design is ideal – In nature, tree root systems will occupy any soil space available. For purposes of practicality, longer, linear soil trenches are often used very successfully in city plantings. Care does need to be taken that trenches are not so narrow that the trees are rendered unstable in high winds. 2.1. Can I use any soil for my trees? 2.2. Is it possible to re-use site soil? In many cases site soil can be reused, following amendment. This should be done under consultation with a soil scientist. In many cases this can represent significant savings. 3.1. What applications would you recommend for StrataCells & StrataVaults? Wherever engineered void space is required beneath paved surfaces, for quality growing media for trees and/or stormwater treatment. 3.2. What are the key differences between the two types of units? StrataCell is the generation 5 system. StrataVault is the more recent generation 6 system. In essence Stratavault has larger apertures and is lower cost to install and supply per cubic. Stratavault suits larger format projects better. Stratacell is ideal for tighter treepits, being smaller and more modular. 3.3. What is the cost comparison between the StrataCell and StrataVault? StrataVault is approximately 10-20% lower cost per cubic metre than StrataCell, depending on the configuration. 3.4. Which is the easiest to fill with soil? 3.5. How big are the openings on both? 4.1. What is the purpose of the reinforcing collar? The purpose of the compacted granular reinforcing collar is to place the geocomposite material under tension for reinforcement of the matrix, and to minimise possibility of differential settlement of pavement. 4.2. Please advise how the width of 200mm for the reinforcing collar was determined? This width was determined as the minimum width for the compaction collar. Objective is obviously to keep over-excavation to a minimum and this width is dependent on the compaction machinery the installer has access to. 4.3. Also, please confirm the depth of compaction collar required. Typically engineers have suggested a benched or tapered design. Majority of projects have utilised the tapered granular collar design to date, for convenience. 4.4. Please confirm what order the soil media and compacted collar are to be placed. These should be placed simultaneously, then the reinforcing collar compacted. 4.5. What options are available to achieve satisfactory compaction/horizontal support in conditions where traditional compaction of backfill material or quarry rubble is not suitable (ie not enough space)? The use of self-compacting or cement stabilised sand (CSS) however this needs to be addressed with Citygreen and the project engineers for approval. 5.1. Engineers request that the soil cells must meet a certain highway load – ie HS20. Is Stratacell, or Stratavault strong enough for this? It is the pavement surface that must take the required wheel load, plus the statutory load factors. Then the calculated, factored-up pressure must be dispersed downwards through the pavement layers. The applied pressure at the base of the pavement must be compared against a down-graded or reduced strength of the supporting cell structure. This is crucial, to give safety margins. 5.2. How do I compare various soil cell systems for strength? The only way to compare different systems accurately is to review laboratory crush tests, for Ultimate Load capacity – the pressure at which the structure fails. 5.3. How strong are the Stratacell and Stratavault systems? 5.4. Are the cells reliant on soil filling to reach these high loads? 5.5. What are the limitations on using Stratacell or Stratavault under a trafficable road? This depends on whether you’re needing to achieve a 5t, 10t or full unrestricted pavement design. Citygreen structural modules have been rigorously tested and modelled for intensive usage. 5.6. Have other clients/councils used Stratacell or Stratavault in the road pavement? 5.7. What is the documented pavement design criteria (CBR)? 5.8. Can concrete be poured directly on top of the Strata units? We seek to install kerbing and spoon drain above the units. Yes, certainly. This is a common scenario. If placing insitu concrete directly over soil cell matrix, an impermeable membrane should be placed to prevent filler soil from being contaminated by cement slurry. 5.9. Please advise if the application is suitable under car parks? 5.10. What are the limitations of the StrataCells under a loading zone? This comes down to the design pressure at the pavement surface, and how that pressure is dispersed through the pavement design. The resulting applied pressure at the base of the pavement must be compared against a downgraded ultimate load capacity for the structure beneath. 5.11. What measures can be used above the StrataCell to reduce the total thickness of the pavement above the cells? Wherever possible utilise rigid pavement, as this disperses load much more effectively than flexible, or granular pavement. If granular pavement layers are required, increased stiffness can be achieved by incorporation of geogrids to engineer specifications. 6.1. What is the closest distance that StrataCells can be placed to services? Services are commonly placed within and adjacent to the matrix. Different service providers have varying clearance requirements, however filled Stratavault/StrataCell systems have equivalent support to native subgrade. 6.2. How are services through the StrataCells managed? Where services cannot be accommodated with the cell structure, a gap is left in the matrix, providing a service corridor, and a bridging slab placed to span the gap, to engineering design. 7.1. Can StrataCells be placed vertically offset from the layer below? 7.2 Alternatively, can StrataCells be cut in half or are half pieces available? 8.1. When are root barriers/Geosynthetic Clay Liner/geofabric/filtergrid liners required? HDPE Rootbarrier membrane is used to prevent invasive tree root damage. Engineered geocomposite (FilterGrid) is used to provide separation of dissimilar materials and to reinforce the structure. 8.2. How effective is the Filtergrid is preventing or deterring root penetration? Whilst FilterGrid is not designed as a root barrier, a recent infield tree root growth study revealed no root penetration of a horizontal layer of this material. 8.3. When is root penetration into the adjacent soil acceptable/not acceptable? Citygreen does not endorse containerising the tree. If there are nearby assets to protect (building foundations, road or pavement, or services) in these instances it is wise to protect that relevant edge, however not the complete pit. Our objective is to provide the soil volume required for the life needs of the tree. 9.1. When are slotted drains required and not? Aeration and water distribution within the soil cell matrix: – Structural soil cell tree pits always require slotted pipe to run throughout the matrix to provide both oxygen and water to the soil environment. This is crucial for the health and longevity of the growing media. Drainage of surplus water from beneath the soil cell matrix: – Standard (non-water harvesting) treepits require positive drainage via ‘agg drain’ if the surrounding soil was not free draining. 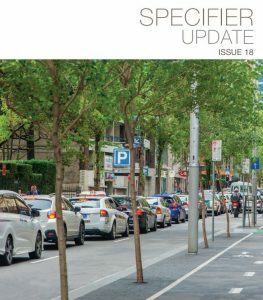 WSUD treepits require positive drainage via under drains. 9.2. Are you able to confirm if the filter sock around the slotted pipe is required, as mentioned in the installation video? We are currently reviewing the option of excluding the filter sock / geofabric as it has a tendency to block up. 9.3. What possibility is there to have a flat base to the tree pit instead of the 5% grade proposed in the drainage? Whilst encouraging drainage is preferred, this may not always be achievable due to the extra height required to create the grade. We recommend a minimum of 2% grade is provided at base of pit, however adequate drainage can also be achieved by setting the drainage line lower than the main base. This is a case-by-case consideration, with the main purpose being to eliminate the risk of the tree pits becoming water-logged, affecting the health of the soil and trees. 9.4. What do you propose when wanting to plant trees with shallow stormwater network? Given that ideally we would seek to provide an aggregate drain and associated connection to the local stormwater network. We would raise the depth of the overall pit, and if possible, bring the matrix closer to the surface. We can also bring the drainage layer within the lower portion of the matrix. 9.5. Can the aeration pipes be incorporated into a stormwater inlet pipe or do they need to remain separate? We would combine these. For sediment catchment prior to reaching the matrix, we recommend pre-filtration points such as pollutant traps, rain gardens or porous pavement. Why? Maintenance advantages. 10.1. What passive irrigation techniques are recommended/possible? A number of methods can be utilized, either altogether, or selectively as required; Porous pavement; kerb inlets, strip drains, rain gardens -to name a few. As mentioned above – the capture and periodic removal of TSS needs to be incorporated into the design. 11.1. How does the size of the required tree pit vary? The size/volume is dependent on the needs of the mature tree species, and the water modelling of the site. 11.2. What is the ideal configuration? Ideally wide and shallow, symmetrical in shape with tree centred in the matrix, to mimic the nature of tree root development. 11.3 Narrow and deep, VS wide and shallow, etc. What is the maximum recommended height and width of strata unit for use with trees? This is purely dependant on the projected mature species’ needs. Please see attached industry formulas for calculating this volume. 11.4. What happens if we are unable to achieve the recommended tree pit size? The volume and quality of growing media directly influences the longterm size and health of the mature tree canopy. If faced with a ‘worst-case’ scenario of not achieving target due to infrastructure constraints, the pit can be moulded to fit within the space available. A reduction in soil volume per tree will result in reduction in both life expectancy, and ultimate size of the tree. 11.5. What soil composition do you propose for the soil cell units when placed in conjunction with a rain garden? Dependant on the flow rates needing to be achieved, we modify the soil specification to suit. The standard soil specification was designed by SESL, renowned soil scientists. Request a soil specification for your project. 11.6. What services can be placed through the StrataCells? Services with a pipe diameter up to 140mm can be run through the StrataCell. Services with a pipe diameter up to 230mm can be run through the Stratavault. Alternatively a gap can be left in the matrix, or vertical supports can be removed with engineer approval – Please refer Point 17 above. 11.7. How are services through the StrataCells managed? Much the same way as traditionally – excavation and dismantling of the matrix is straightforward.